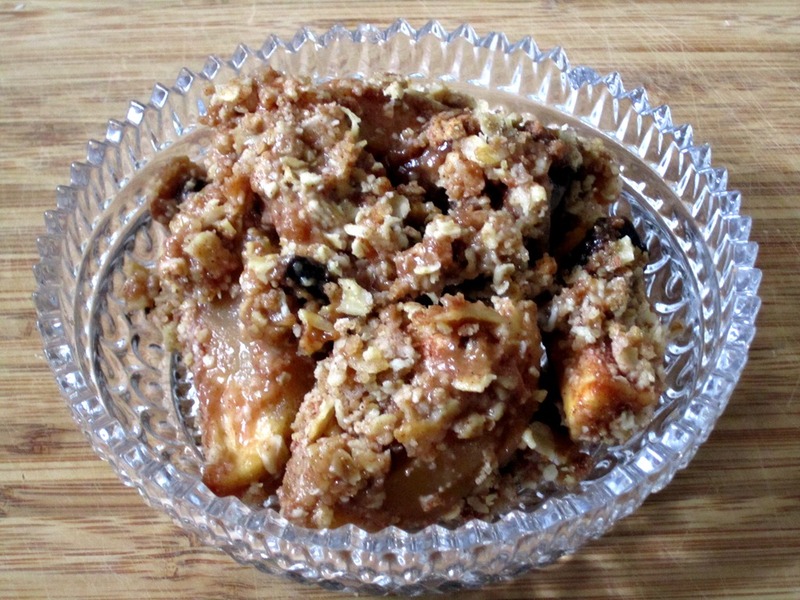 I shared with you an apple crisp recipe not too long ago – it was one of the best ones I’ve had in a long time. But, I have continued to tweak the recipe and I think I have an even BETTER recipe to share with you. I made it Sunday to have as dessert after dinner with friends. Everyone agreed it was fabulous. And, SuperMan and I have eaten leftovers for breakfast a couple times this week – it makes an awesome breakfast – think Apple Cinnamon Oatmeal but in the best possible way. One of the secrets to the new and improved recipe is using Grape Nuts cereal as part of the topping. I found just plain oatmeal was a little too soft and not “crispy” enough for me. I wanted a little crunch, but didn’t want to use nuts (the girls don’t care for nuts) in the topping. Don’t be afraid to try a little for breakfast! It’s so good… and it’s full of the same breakfast-y ingredients we eat anyway – fruit, oatmeal, cereal, etc. Why not? Place the sliced apples in a lightly greased 9×13 baking dish. In a medium bowl, mix together the sugar, flour, cinnamon and sprinkle over the apples. In a large bowl, mix the topping ingredients, adding the butter last and using your fingers to mash the butter into the topping ingredients. Sprinkle the topping over the apple mixture, spreading to evenly cover the apples. Bake for 45 minutes or until the juices are bubbling and topping is a deep golden brown. Note: I use my apple slicer to make my slices because I like big, chunky pieces of the apple in my crisp. You can use diced apples or smaller slices if you choose, I just prefer to have more discrete bites of fruit in my crisp. This sounds great. I was so upset to find the new issue was out as I wanted that apple crisp recipe (and the brisket one). I love apple crisp. Have you tried the Weight Watchers one, I have it but haven’t had a chance? Your photos of your weight loss are very inspiring, as is your truthfulness about having the surgery. I’m happy to have found this blog.